The brass plaques that pockmark the sidewalks in Vienna’s historical Jewish district are easily missed. Bolted into the ground outside apartment buildings, they are Holocaust memorials in miniature, each inscribed with the names, dates of birth, dates of deportation and—if known—dates and places of death of victims of Nazism who had once lived at the buildings in question. This area had been the center of Jewish life in Austria’s capital since the 17th century, and the brass plates—known as Stolpersteine (literally, “stumbling stones”)—plot a course that testifies to the near-annihilation of the community during World War II. One set of Stolpersteine stares up from the entrance to the building where my grandfather grew up in the 1920s. 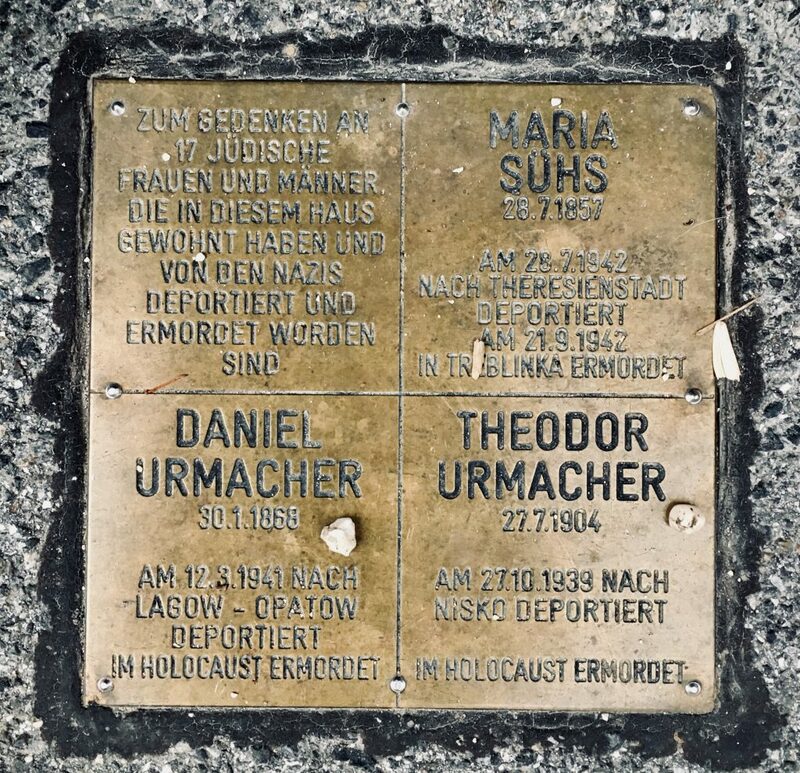 My great-great-grandfather and his son, Daniel and Theo Urmacher, are featured in this trail of names, and on a recent trip back to the city, I find the plaques as pristine and clear as they were on their unveiling four years ago. I think nothing of their appearance until the following evening, when my Austrian cousins tell me and my partner over dinner that numerous Stolpersteine have recently been vandalized, seemingly by racists emboldened by the formation of a far-right government in Austria. My relief that the sanctity of my relatives’ memory has, at least for now, been preserved, is swallowed up by a familiar, creeping queasiness, for when fascism stalks the land not even the dead are out of reach. And then my thoughts turn to my grandfather, Kurt Roth, who escaped one fascist regime—and a devastating immortalization in brass—by being dragged into a war against another. Kurt, born in 1920 in Vienna to Polish-Jewish immigrants, was a child when his father took him to fight in the Spanish Civil War. He joined the Spanish Republican Army at the age of 16 and remained in Spain until early 1939, when Franco’s advancing armies forced the Republicans to retreat. Kurt, along with hundreds of thousands of other soldiers and Spanish civilians, crossed the Pyrenees into France, winding up in an internment camp in Argelès-sûr-Mer near the Spanish border. Finally, his mother traced him via the Red Cross and, in 1940, he was able to join her in England where she had arrived after fleeing the imminent Nazi annexation of Austria. Yet even in the United Kingdom, my grandfather was not safe from the impact of Nazism; after the Nazi-collaborationist Vichy regime was established in France, the British government declared all German and Austrian men enemy aliens, disregarding that so many were Jews fleeing Hitler’s sphere of influence. Kurt was interned and deported, spending two months in the hull of a ship that took him and hundreds of others to Australia, where they were kept in an internment camp for eight months before being pardoned and allowed to return to England. Many stayed behind; my grandfather was among those who returned to the adopted home that had betrayed them. A return to Nazi-controlled Vienna was, of course, out of the question. I have never been able to hear Kurt’s story first-hand. Yet my grandfather’s silhouette has rarely left my mind’s eye over the past year. Growing numbers of repressive regimes have employed distortion and censorship while manufacturing an assembly line of untruths, augmenting racist, antisemitic, and white supremacist policies and discourses. Whether it is former White House press secretary Sean Spicer announcing that Hitler “was not using the gas on his own people;” numerous Trump officials parroting the “Lost Cause of the Confederacy” narrative of the American Civil War; or Brazilian military police raiding universities that teach the history of fascisms and confiscating anti-fascist materials, just before the country elected the far-right Jair Bolsonaro as president; these regimes churn out historical fictions and erasures in order to justify the present, creating a complementary form of propaganda that obscures and distorts antecedents of current oppression in order to enable their renewal and restrengthening. Historical revisionism of this nature is designed to destabilize, but not merely to undermine our sense of certainty or “truth” about current conditions. It is designed to destabilize our ability to engage with our histories, to activate and learn from our past, in a moment of danger. This is not the sowing of “post-truth” chaos for its own sake; its net effect is to thrust us into a state of neutralized inertia, caught between confusion and despair. It’s into this daze that the figure of my grandfather has been flickering in the past year. As someone who took part in a desperate struggle against fascism, his stories have been thrown into ever-sharper relief as our political situation has deteriorated. And Kurt’s memory—or rather, the fragments of him I’ve been able to piece together secondhand—has acted as a shock absorber in response to the increased accumulation of rhetorical and physical violence. The reason why lies with a writer and critic whose path my grandfather nearly crossed as he edged ever closer to the United Kingdom—and in whom, for me, Kurt’s story and the crisis of our present moment have powerfully coalesced. In early 1940, German Jewish philosopher Walter Benjamin mailed his final completed work, an essay “On the Concept of History,” to Hannah Arendt. He had just finished writing it and requested that it not be published (although colleague Theodor Adorno would end up printing the essay in 1942, under the title Theses on the Philosophy of History). Shortly after, Benjamin, who was then based in Paris, would attempt to flee Nazi-occupied Europe, and his Theses bear the urgency of a work written as fascism marched outside his window. In its broadest sense, Benjamin’s last full text presents a critique of historical methodologies. Yet what it offers us is something that goes well beyond an academic exercise, for Benjamin insists that articulating history correctly is not only a moral imperative but also a crucial weapon. He has left us with something far more valuable than a scholarly treatise: a manifesto on how to engage the past in order to unleash its potential to resist oppression in the present. The crux of Benjamin’s argument lies in his rejection of the assumption that progress is inevitable. He calls on us to turn our attention to the past rather than bank on an unknowable future, and urges us not to accept the victors’ history—for there is, he writes, “no document of civilization which is not at the same time a document of barbarism.” So we must, instead, mark and make amends for the often silenced histories of those claimed by the past’s cruelties. Only if we “brush history against the grain,” he writes, might we disrupt the luxury of believing that moments that feel like a rupture are anomalous—whether the rise of Nazism or the current resurgence of racist authoritarianism. What these seeming ruptures represent, rather, are reconfigurations of a status quo in which suffering and destruction are merely redistributed: As Benjamin writes, “[t]he tradition of the oppressed teaches us that the ‘state of emergency’ in which we live is not the exception but the rule.” It is, in other words, a dangerous fallacy to mistake evolution for resolution. The past and its victims are, then, our sentinels, showing us the roots, development, and endgames of our political disasters—as well as the ways in which they have been resisted at different historical junctures. But it is for us to pay heed to these lineages and linkages. It is these histories that can help inoculate us against the insidious idea of inexorable progress, for as long as we rely on this myth, we remain complacent—both extinguishing the sacrifices of history’s dead and blinding us to the capacity for fresh barbarisms. We cannot turn away from our past even for a moment, for “every image of the past that is not recognized by the present as one of its own concerns threatens to disappear irretrievably.” And when these images do disappear, so does much of our ability to remain resilient in the face of authoritarian regimes. In the end, Benjamin argues, our approach to the past must be “to seize hold of a memory as it flashes up in a moment of danger.” And so it is, in our current moment of danger, that the memory of Kurt has flashed up with ever-increasing clarity and urgency, bringing with it the history of ruinous prejudices against which he and his contemporaries fought and from which they fled. He, too, has been here before, and the act of seizing his memory has brought me face-to-face with my past. His lingering, thickening presence in my life testifies to the two-way relationship Benjamin implies is possible with our past—that we can be its wards, so long as we accept its silenced casualties as our wards in return. This has been my experience of my grandfather’s memory; as I have sought to preserve it, piece it together, and shield it from the attrition that comes with a linear and progressive concept of time, so has it come to shield me. Kurt’s story has, at so many moments of despair and disorientation at the accumulating crises around us, pierced the fog—and so too have Benjamin’s words and the substance they have given to my grandfather’s present absence. A few months after finishing “On the Concept of History,” Benjamin began his attempted flight from Nazism. He reached Spain on September 25, 1940, with papers for onward travel to the United States, having crossed the Pyrenees on foot from France—the same route taken by my grandfather, but in the opposite direction. Yet Benjamin arrived on the same day that the Franco regime had ordered the Spanish border closed, and was told by the authorities that he would be deported back to France the following morning. With his escape route cut off, Benjamin succumbed to despair and committed suicide in a hotel in the town of Portbou, Catalonia, 20 miles away from Argelès-sûr-Mer where Kurt had been interned. Benjamin’s body was found on September 26, 1940, 14 months after Kurt had been released and made his way to the United Kingdom. Benjamin’s urging that we remember and learn from the trials of our ancestors is not the only thing that has resonated so strongly with me over the past year. It is, too, the parallels in the geographies, the journeys, and the choices made by both him and my grandfather that have haunted me—above all, the final decision they both took. For although Kurt survived the Spanish Civil War, its horrors would eventually come to claim him; he remained traumatized by his experiences in Spain, his deportation to Australia, and his narrow escape from the Nazis until he, too, took his own life in 1980, four years before I was born. Natasha Roth is a blogger and former associate editor at +972 Magazine, and is currently a PhD student in History at the University of Virginia, Charlottesville, where she is researching the Jewish far right in Israel-Palestine and the United States.